:Trust makes everything better. It's the glue that binds people together. From our families and friendships to our companies and communities, we know that trust is the fuel that drives long-term success and impact. But we also know what betrayal feels like. We know that trust is a fragile, vulnerable gift that can be abused, broken, and exploited with devastating consequences. 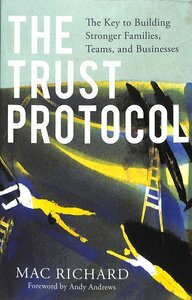 The Trust Protocol provides a clear path not just to manage these tensions but to embrace them and experience the meaning and significance we're created for. About "The Trust Protocol: The Key to Building Stronger Families, Teams, and Businesses"
Mac Richard is the founding pastor of Lake Hills Church in Austin, Texas, which has an average weekly attendance of 2,000. He and his wife, Julie, launched Lake Hills with a passion to redefine church for the city of Austin and beyond. Mac and Julie have two college-age kids, love any time they get to see them, and are thoroughly enjoying the empty nest years.